Finland - Samlerhuset Group B.V.
Headquartered in Helsinki, Suomen Moneta markets and distributes collector coins and medals in Finland. Finnish collectors are interested in sports-related coins, medals and ingots, such as the Olympic commemorative coins and the different medals and ingots honoring national and international sports superstars. Suomen Moneta enjoys a tight and fruitful cooperation not only with the national Olympic committee, but also with several top athletes and with national sports teams and organizations. 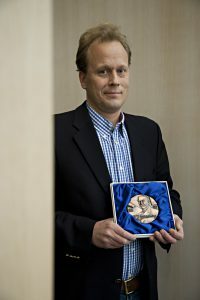 From every olympic commemorative coin sold in Finland, a sum is allocated to the IOC and the National Olympic Committee. In September 2009 Suomen Moneta closed its first sponsorship deal with two-time sailing world champion Sari Multala and previous speed skating world record holder Pekka Koskela. Today the Moneta sports team consists of seven finnish top athletes, and the company has produced several coins and ingots honoring current and former sports greats (picture right). Suomen Moneta has also supported the Finnish Ice-hockey federation, through the sale of commemorative gold and gold plated ice-hockey ingots, emblazoned with the logo of the Finnish national ice-hockey team. In addition to being deeply involved in the world of sports, Suomen Moneta has also played an important part in several fund raising campaigns for Finland’s war veterans, single handedly helping the national war veteran foundation raise more than 2 million euro since 2006. In 2014 Suomen Moneta started supporting Crisis Management Initiative, CMI, which is one of the world´s leading independent conflict resolution organisations. The Finnish not for profit organisation was founded in 2000 by Nobel Peace Price Laureate, President Martti Ahtisaari, who still functions as chairman of the CMI board.